- In the custom scorecard, it is now possible to hide the directional, colour coded trend arrows. - New date range added: "3 Quarters Ago"
- In categorized column charts, you can now choose to display a % instead of the actual figure for each bar. - You can now choose for a dashboard to be secured upon creation. This means that only people that you specify can see it. - When creating a new user manually, you can now prompt them to reset their password when they first log in. - Admin users can now force a password reset message to appear for any user the next time they log in from the User Manager. - In linked tables, we have implemented a menu from which you can update your linked columns, both numerical and categorised. This menu appears in linked tables only, in the top bar of the table, next to the &apos;More&apos; menu. This month we&apos;ve got quite a lot of changes in the log. Read more about these below and feel free to ask us at any time if you have any questions. Just send us an email on support@targetdashbaord.com. - Overhauled the &apos;design&apos; section of Target Dashboard. - Added a new type of scorecard - the Custom Scorecard. Watch a video about it here! - New beta feature allowing you to see data drill downs for your charts when clicking on them is now available for all users with beta features turned on. This feature allows you to click on any bar or point in your chart and see a breakdown of the data behind it. It currently has to be turned on for each chart individually, and the option to turn it on can be found in the options tab in the chat designer for any time or category charts. It does not currently work on all columns bar charts or horizontal category charts with multiple values. - Updated the way dashboard wide filters work to make them more efficient and easier to set up, and added the option to filter by a User Field assigned to specific users. This is a secured filtering option that consumes Client Filtering Licenses. - Added a new dynamic function for rolling average that can be used in calculated columns. $sra(<column ID>, num_of_periods) This calculates the rolling average dynamically and can successfully be used on categorized data. - New password recovery function that should be easier and quicker to use. - A horizontal category chart can now be made to colour code based on whether high or low values are set to be good in the column settings for the column that&apos;s being measured. - Improved the Excel import. Importing very large excel files, especially ones containing lots of text fields, should now be significantly faster. - There was an issue with how a gauge scaled when measuring a percentage. This has now been fixed. - Made some minor changes to the user permissions settings when adding a new user in order to further clarify these settings. - The &apos;My Data&apos; section has received a complete update, and now sports a new, simpler layout. - Updated the automatic import routine for Dropbox connections to increase efficiency. - Added an NPS Score wizard that allows you to easily set up NPS data that calculates your NPS score. - It is not possible to rearrange the order in which charts and visuals appear in the email digests and dashboard presentation mode. this option can be found in the dashboard settings which can be accessed from the top bar on every dashboard. - Minor updates to the scorecard interface. - Overhaul of the presentation module that allows it to include all type of dashboard visuals, including gauges, scorecards, table summaries and comparison charts. - Improved how the scorecard works and displays. - Fixed an issue with how years grouped by financial year are displayed. - Fixed an issue with chart lines in the PDF report. - Added chart titles to print mode. - updates to the Target Dashboard website. - The horizontal category chart now has a colour selector. - Fixed a number of spelling mistakes and minor bugs. - Improved the efficiency of data imports. - You can now select to display dashboard items by financial year, as well as calendar year, quarter and month, on the dashboard. The settings for financial year can be adjusted in account management and is set by default to be the same as the calendar year. - Added a new formula for calculated columns - enter &apos;1&apos; to create a column that contains 1 in every row and is cumulative. - Improved the comparison chart filter. - Improved the &apos;one off&apos; data grab post capabilities. - New layout for the data automation settings. - The Dropbox feature has come out of Beta! - Improved email templates for automated emails. - Improved the summary page for Dropbox and other data Connectors. - Improved the Present view on the Dashboard. - Adjusted how the PCT formula works when set as a target column. - Custom title on Digital Gauges. - Customisable colours on Comparison Charts. - The Comparison Chart now properly handles all calculated columns. - The list of Dropbox connections list now displays as it should for all users. -You can now add a customisable cover sheet to your PDF reports. The option to do this can be found in the PDF report pop-up window. - You can now choose to display the bottom 5/10/20/30/40 categories in a category chart in addition to the top 5/10/20/30/40 categories. - Added a new formula for calculated columns to prevent the values in that column from accumulating. $fix(20) will always return 20 when charted, grouped and/or filtered. This can be used as a target column and can be very useful if your target is a percentage and you don&apos;t wish for it to be cumulative. - Calculated columns can now have targets. - Added new functionality that will allow you to update all your Dropbox links from one place by selecting &apos;My Connectors&apos; from the left hand menu in the &apos;My Data&apos; section. - Improved the Excel export functionality, resulting in a faster, smoother experience. - Made improvements behind the scenes to the Dropbox import functionality. - Updated the date range layouts on the dashboards and in the chart designer. - Added several new date ranges. - Added the ability to export individual dashboards to a PDF file. The link to this feature can be found at the bottom of each dashboard. - Improved the look and feel of the price plan on the Target Dashboard website. - Added a missing icon for Dropbox integration. - Added scheduling to the Dropbox integration. 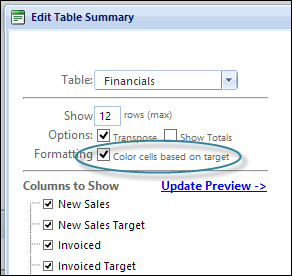 - If you have a target attached to your data, you can now choose to add colour coding to your table summaries. - This same colouring method has been added to the scorecards and the PDF management report. - Added a new menu item for dashboard wide filters (Enterprise users only) in the Edit menu in the main tool bar on the dashboard page. - Fixed an issue with the use of apostrophes in dashboard wide filters. - Improved back end processes to allow users to continue working in Target Dashboard while the system is being updated. - Page breaks after each chart are now optional in the PDF management report. This means you can fit several charts onto the same page if you wish. - You are now able to control the size of your charts in the PDF management report. - Improved the graphical representation of the Goal Lines in the Lines feature (options for this can be found in the chart designer). - The scorecard hover feature now works on scorecards where filters are applied. - Added the option to email your dashboard to anyone. This option can be found in the Emails drop-down on the main dashboard page. - Fixed a bug in the filter for dashboard emails. - Fixed a few minor text and spelling errors. - More in-depth in-app help and tips.